Interlaken - the most beautiful town I have seen so far, is located in between the elegant waters of Lake Thun and Lake Brienz (hence the name "Interlaken"), and is surrounded by the peaks of Alps in all the directions! Yes, the massive peaks of Jungfrau, Mönch, and Eiger set the borders for this city; but Interlaken is not in the mountains – it's quite flat. That makes Interlaken a perfect home base for exploring the beautiful mountains all around the central region of Switzerland. 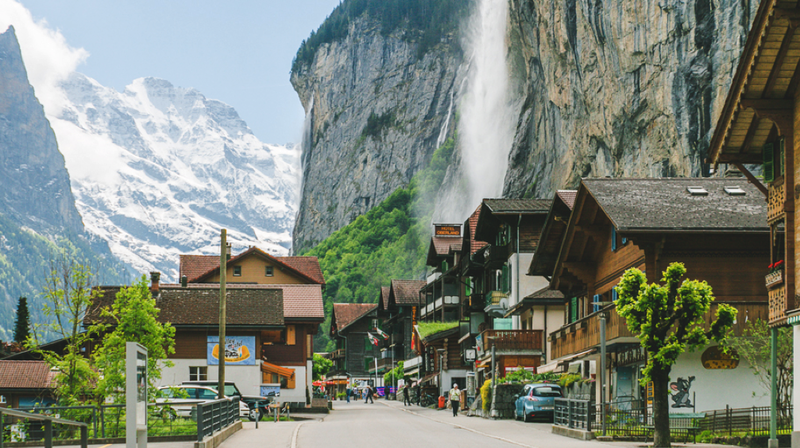 Interlaken has always been attracting numerous visitors; it’s a favourite vacation place for many royal families over 100 years; The gorgeous castles and condos’ you see all over the town can tell you rest of the history. 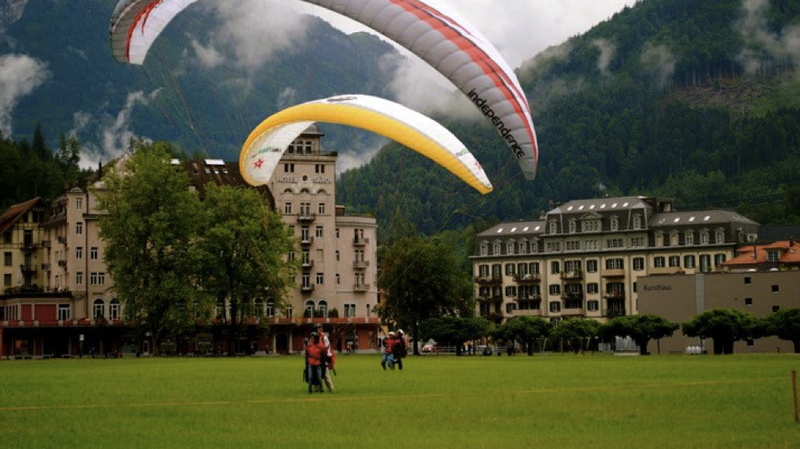 The Center of Interlaken itself may not be that scenic, but with its unique location & transport infrastructure, Interlaken is vital for exploring all the marvels of neighbouring mountain peaks, valleys and lakes. By Rail: Interlaken is well connected by trains; there is a frequent connection to/from all major cities like Zurich, Geneva, Basel, Berne and Luzern. There’re quite a few inter-countries as well. Interlaken has two train stations. Interlaken Ost is the most important, Interlaken West is smaller. From these stations, trains, buses and boats go to all places of interest. By Road: That’s what we did. It’s very convenient and easy to drive. Directions are very clear, otherwise, also you have GPS navigator. There are many tour bus operators too. One of the popular is Bus2alps, a big company operates private buses from all nearby top attractions such as Florence (Italy), Rome(Italy), Paris (France) and Munich (Germany) to Interlaken. Interlaken town is small; you can get around all the town by walk/ bike (Ofcourse if the weather supports😏). Also for the lazy ones: you have a good local buses connectivity; which is also “free” if you carry your hotel guest cards. I think, all the hotels in Interlaken give the public transport card to their guests at no extra cost. Whether you’re a solo traveller, tripping as a couple, or with your family/ friends/groups, these two lakes are the first one to visit. They are so beautiful; their stunning colour and scenic beauty will amaze everyone. Lake Thun (Thunersee) lies in an old glacier basin and used to be part of the Brienz Lake (Brienzersee). The two lakes are separated due to the sediments lately. Lake Thun is kilometres long and 3 kilometres wide. Brienz is comparatively smaller (14 kilometres long and 3 kilometres wide), but hugely popular among the Europeans. It just enough to sit on the beach, enjoy the views of the landscape, and relax yourself. When you have extra time (also money😜), I would recommend you take a boat tour as well. By boat, you can visit the western end of the lake Thun - which is a picturesque old medieval village with a stunning lakeside castle. The castle was built in the 11th century, is now serving as a historical museum with a lot of artefacts from the Roman era. 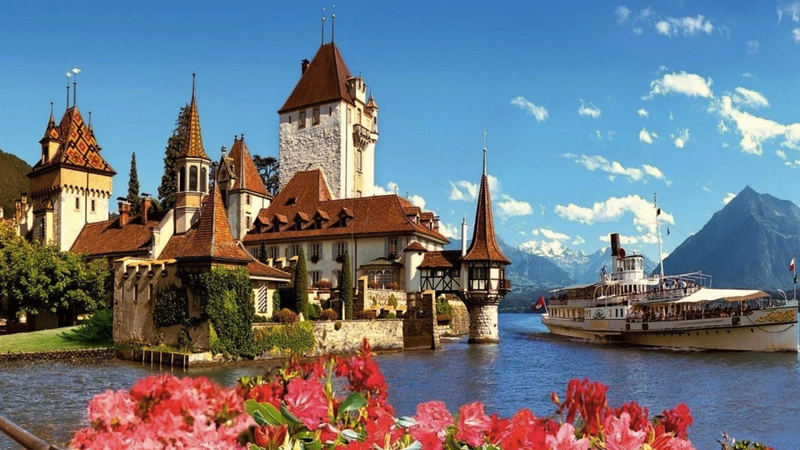 Cruise timings: Both Lake Thun & Brienz cruise are available only during the summer months (April – October) full day; During spring/autumn timings might change every day as per local weather conditions. Winter cruise is also possible in Lake Thun (not sure about Brienz). Lauterbrunnen area is known for outdoor adventure sports activities like Paragliding, bungee jumping, White water rafting,..etc. There’re a whole bunch of operators arranging these adrenaline rush sports!. Even if you’re not a fan of extreme sports, you’ll absolutely love the beauty of this small village. The valley and waterfalls of Staubach waterfall make the whole region so picturesque. This waterfall is the second highest in Europe. You can trek almost till the foot of the waterfall, (but we didn’t because of the bad weather). The beauty of this Waterfall is truly breathtaking when you see it for the first time! You must experience this for yourself. This monastery was from the 11th century, served as Augustinian convent till the late 15th century. Heard that the monastery still has caves from 15/16th century, connecting the path leading all the way to “Santiago de Compostela” in Spain. I don’t have much idea about its history or significance, but for me, the buildings fine gothic architecture and bell tower are simply amazing to watch. Höheweg is the main social meeting place (more like a centrum) in Interlaken, most of the big hotels, restaurants, souvenir shops and boutiques are scattered across. You have a range of shops to get the famous chocolates, knifes to Swiss Watches. What is so remarkable here is the huge 35-acre open-green promenade. Such a whopping beautiful area in the middle of the town originally belonged to the Augustinian convent was bought by a group of 37 hotel landlords and rich private individuals; and left as an open-space dedicating to the community of Interlaken! (Great people, aren’t they?). Relaxing with family/friends/loved ones and enjoying the beauty of Alps from here is an awesome thing to do. Harderkulm is a viewpoint at 4,300 feet height, offers you the best view of Interlaken and its surroundings. You can trek all the way-up, or take the 8-minutes short funicular train ride. There’s a nice panoramic restaurant at the top. 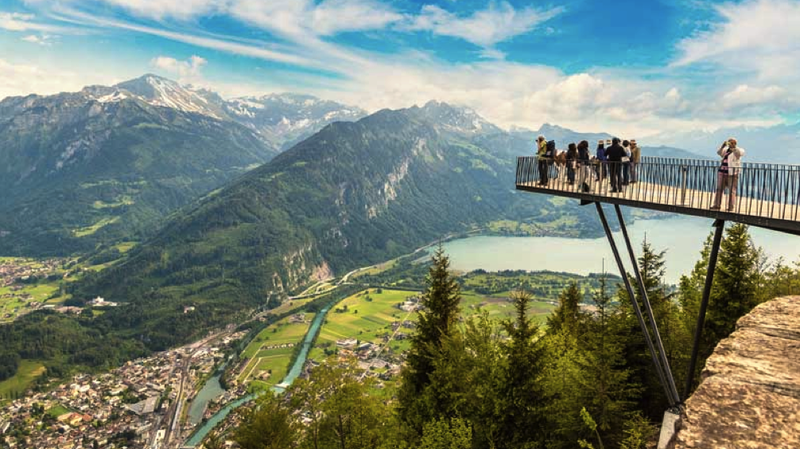 It gives an incredible panorama of the Eiger, Mönch and Jungfrau peaks and there’s a “Two Lakes Bridge” from where you can watch both Lake Thun and Brienz from the top. But keep it in mind that the cost for the funicular from Interlaken is about $21, and anything you get in the panoramic restaurant is also as high it is located. I’m not a foodie person, just ok with whatever I get while travelling on the way. But that doesn’t mean that I don’t try local foods. But Interlaken was quite tricky. I couldn’t really find out what really was an Interlaken local cuisine. Whatever I saw, ate are only a French, Italian, German, or Asian Cuisines. I think I’m not that lucky with food. However later, a Swiss colleague of mine (who’s from Lucerne a nearby town of Interlaken) recommended the some of the typical Swiss culinary: Pastetli (literally translated as "meat pie"),wide range of Wurstsalats (it is a sort of a cold sausage salad), Bernese Oberland beef and Swiss Highland Whisky-marinated veal. 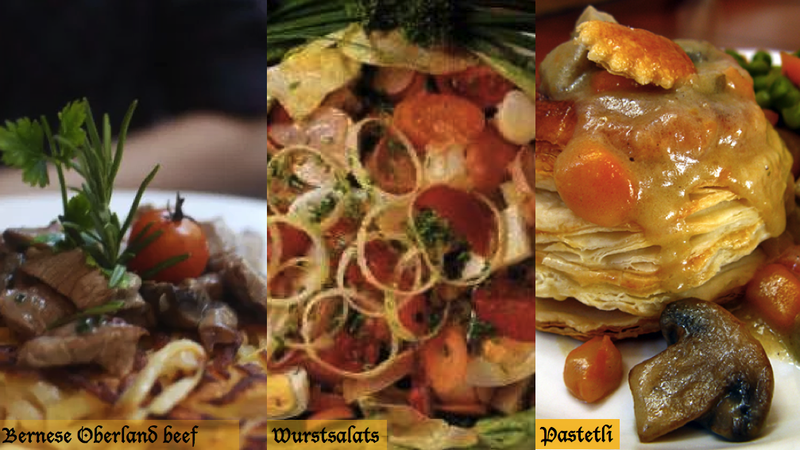 And here’s the link to The Top 10 Restaurants In Interlaken recommended by the local. “En Guete! "(Bon appetit in Swiss). 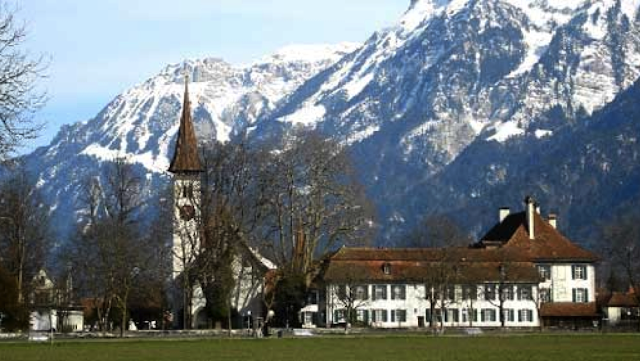 Interlaken has a variety of hotels with all the possible stars. The most lavish hotel in Interlaken is Victoria Jungfrau (think it was about €400 per night!). Other top ones are Grandhotel Giessbach and Hotel Interlaken. But if you are on a budget, it is wise to stay little away from the town centre; there are many tiny towns within the radius of 10 minutes around can give you a good deal for the money. Just do a google search, you’ll find 100s of options. Are they don’t fit your budget, then Air B&B is your friend😛! Hope we covered everything that you’ll need to know about visiting Interlaken. Feel free to comment in case of any questions, will be glad to answer.